Did you know that on average, four homes leave the market each day without getting sold, requiring the homeowner to start all over and find a listing agent that can get their home sold? Imagine the frustration. You decide to move (perhaps you want to take advantage of low interest rates or the invigorated market) so you hire somebody for the job of selling your home. They seem to know what they are talking about so you sign a six month or one year agreement, and then you start making plans for moving. But nobody seems to want your home, and you wonder what is going on. We measure listing activity in the Tallahassee MLS on a daily basis. You might have seen our recent report showing the four key housing trends that we like to monitor. The real estate graph below uses just one of those trends, a measurement of the homes that failed to sell each day. It is important to note that the graph above measures the one year trend of the number of homes that failed to sell each day. That means the changes that we see over time are due to real changes in the Tallahassee real estate market, not due to seasonality that occurs for home sales. 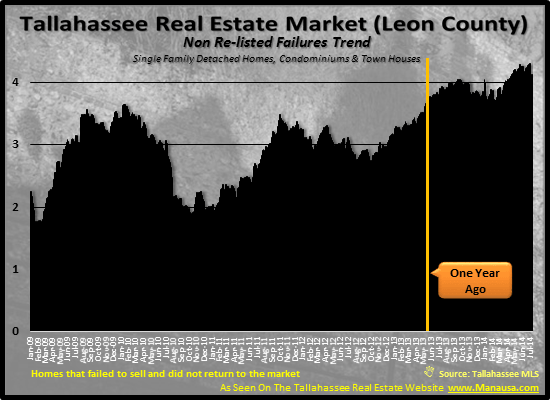 So one year ago, roughly 3.2 homes failed to sell each day in the Tallahassee MLS, but the current trend is 26% higher at just over 4 per day. Why do we bother to track failures? Because we want to know how difficult it is to sell a home (since that's we do here at Joe Manausa Real Estate :)) so we can give the best advice possible to the people who hire us to sell their homes. I have written numerous articles on how to find the best Realtor available to market and sell your home, yet I feel compelled to address this critical point on a regular basis. Why? Because we specialize in helping home sellers who failed to sell with a previous real estate agent/real estate company, and I know how mis-informed most of these home sellers are. They did not do the proper pre-listing homework and they ended up having their home on the market for many months or years without getting it sold. If you ever have had your home on the market, you know it's like living in a museum and it disrupts your normal routines. All home sellers eventually learn they want to sell their home fast and for top dollar. So how does one accomplish these two important goals? The simple answer is "do some research before you list your home." My top 51 articles for home sellers can be found by clicking the link in this sentence. If more home sellers would spend a few hours to learn more about the home selling process and which local real estate companies really dominate with an internet marketing plan, then there would be far fewer home sellers who either lose time or worse ... lose money by having the wrong agent help them. 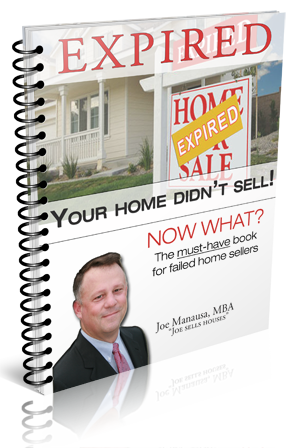 I also invite you to download my FREE e-Book for home sellers (simply click on the image to the right), as it was initially written for people who failed to sell a home and who needed to find a listing agent to actually get it sold.